Hot Water on Demand with the EZ Heater - Hydro-Thermal Corp. The EZ Heater® is the industry leader in all hot water applications with its unique internal modulation, and self-cleaning ability. With instantaneous hot water where you need it, The EZ Heater is ideal for washing stations where maintaining a minimum temperature is critical, CIP (Clean in Place) systems, and anywhere that you need reliable hot water now. High velocity steam eliminates scale build up, making costly chemical baths and unexpected shutdowns a thing of the past. This unique patented design assures precise steam control and produces predictable results based on the position of the stem plug. 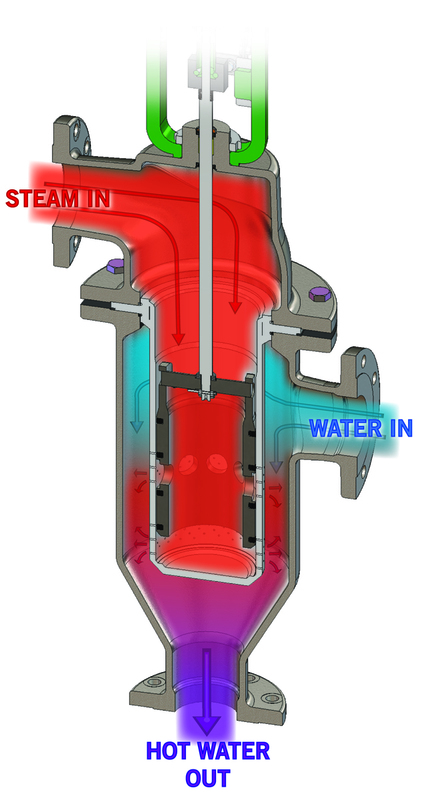 A variable-area steam nozzle meters steam flow at the point where steam and liquid first contact and mix. This technique eliminates the need for an external steam control valve. Choked flow is the phenomenon of accelerating a vapor to maximum velocity by creating a pressure differential through an engineered nozzle. Establishing choked flow precisely controls the heating of the liquid by metering the steam flow. For more information on the EZ Heater’s water applications, click here. Positive return on investment (ROI) - unbeatable energy savings! The EZ Heater is made for your specific operating conditions. We need to know a little bit about your process and plant set-up in order to design the heater or skid that will work best for your conditions. Please fill out this form or contact us here.